The study assessed indicators of educational quality and selectivity as predictors of Academic Reputation (AR) and desire to attend a college. Surveys were mailed to 1,004 high school seniors randomly selected from a large database, yielding 198 respondents. Educational quality indicators were regressed on AR. Curriculum rigor and social/cultural activities were significantly predictive of AR. Class size and individualized attention from faculty were not. Curriculum rigor and individualized faculty attention were predictive of desire to attend. Class size and social/cultural activities were not. Selectivity variables (min. high school GPA, class rank, SAT scores) were regressed on AR and all were significantly predictive. However, none predicted desire to attend. The results challenge notions about relationships between AR and educational quality and selectivity indicators and their usefulness in enhancing desire to attend. Conard, Michael J. and Maureen A. Conard. 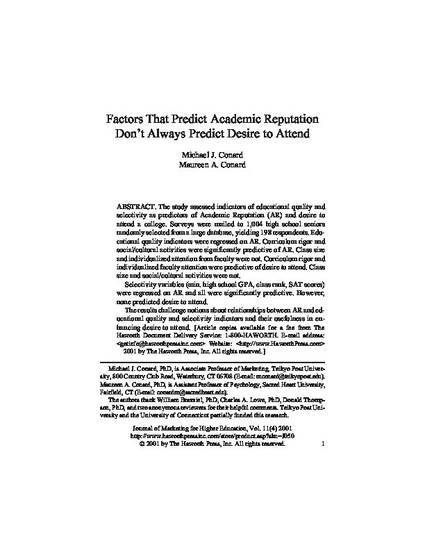 "Factors That Predict Academic Reputation Don't Always Predict Desire to Attend." Journal of Marketing for Higher Education 11.4 (2001): 1-18.